InstallAware's MSI builder solutions completely insulate you from the proprietary challenges of the Windows Installer engine and database, while generating fully logo-compliant MSI setups. ENDS SOON start saving money today BUY NOW! Are you tired of wrestling with Windows Installer "gotchas" and elusive misbehaviors? InstallAware puts you back in control of your setup, giving you back the time you need to accomplish more of your goals. 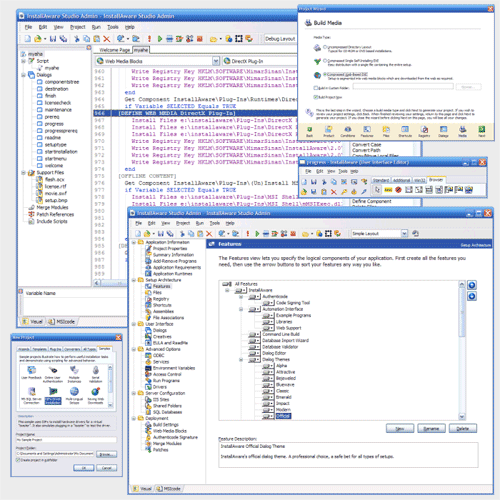 InstallAware is a high-productivity system for building Windows Installer setup applications; providing a modern two-way interactive development environment, an advanced setup language that does not require programming skills, visual tools and dialog designers, wizards, templates, samples, a compiler, dynamic dependency scanning, automated ICE validation, and guided debugging. Both the MSIcode and Visual Designer stay synchronized — changes in one view will always be visible in another, allowing you to quickly prototype your setup programs with InstallAware's rapid design and development capabilities. What's more, InstallAware is the only MSI builder that offers the MSIcode setup language. Read more about this unique technology and how it cuts down your development time. Click here to download our MSI builder technology whitepaper (available as a PDF file) or Download Your Free 30 Day Trial today! What Do Our Customers Say About InstallAware?